The first Rafale fighter jet for Qatar Air Force started the flight tests at Istres Air Base (France). According to defens-aereo.com the first Rafale for Qatar Air Force, the DQ01, has just begun its first flight tests. The Rafale took off from Istres Air Base on January 09, 2017, in order to begin its flight test campaign in accordance with the buyer specifications. The flight tests include the integration of a helmet sight, as well as the adaptation of the SNIPER laser observation and designation pod, produced by US company Lockheed Martin. The test flights are conducted by French pilots of the Dassault Aviation. At the same time the French Air Force conducts its part of the project by training flight crews and technicians of Qatar Air Force. According to journalist Olivier Fourt RFI the theoretical training is currently taking place at the Mont-de-Marsan Air Base. After that, the airmen will join the Saint-Dizier Air Base, where they will be trained in the "Aquitaine" squadron specialized in the conversion to Rafale. The Dassault Aviation believes that if everything goes as planned the first Qatari Rafales should land at Mont-de-Marsan in spring 2017. The contract was signed last May 4, 2015 in Doha by the President of the French Republic François Hollande, and GIE Rafale (Dassault Aviation, Thales, Snecma, MBDA). It provides the delivery of twenty-four Rafale to the Qatar Air Force for approximately 6.3 billion Euros. 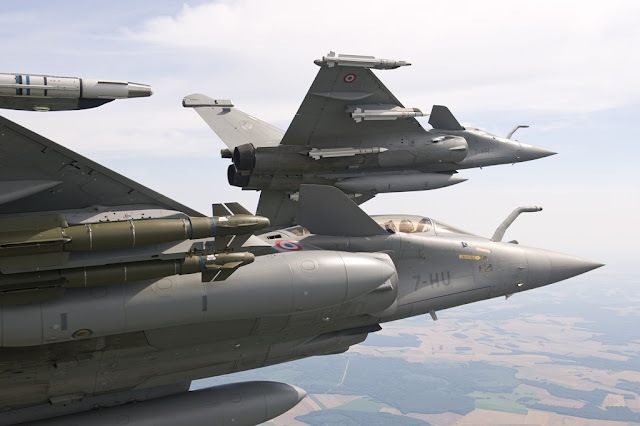 In addition to the twenty-four aircraft, Qatar has made an option for twelve additional Rafale which could be ordered in a few years in accordance with the operational needs of the armed force. The contract, the second in export for the Rafale (Read INDIA IS READY FOR RAFALE), provides the delivery of eighteen Rafale single-seaters and six two-seaters (Rafale DQ). It also provides for the delivery of the air-to-air missiles MICA IR, MICA EM, and Meteor, the air-to-ground cruising missile SCALP-EG, as well as GBAS air-ground bombs guided laser and AASM Laser and GPS.